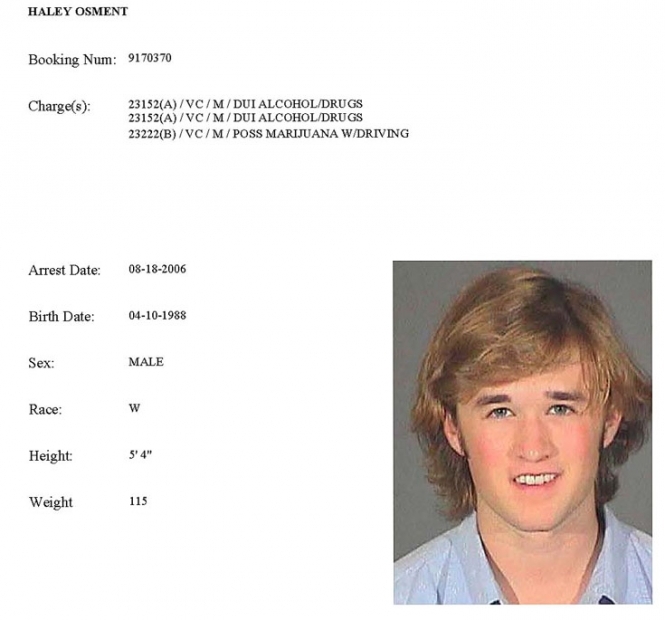 Actor Haley Joel Osment was charged with drunk driving and marijuana possession after he crashed his 1996 Saturn station wagon while returning home from a Los Angeles concert in July 2006. The 18-year-old Osment, who starred as the boy who saw dead people in 'The Sixth Sense,' suffered minor injuries in the accident and was briefly hospitalized. Osment, who posed for a mug shot snapped by an L.A. sheriff's deputy, was released from custody after posting a $15,000 bond. Submitted by BirdBrain on Fri, 2011-03-18 21:37. I think this is the creepiest mug shot I have ever seen. Tell me he isn't an elf. Submitted by Jerjerrod on Sat, 2011-01-29 02:32. 18 years old, 5'4" tall, 115lbs. I think it IS a girl. Submitted by DocWIN0 on Thu, 2010-09-30 00:59. Submitted by Shelly Shores on Tue, 2010-08-31 05:04.